Choosing a DJ who is professional, capable and creative, who will deliver your ultimate playlist party is no mean feat. A mobile disc jockey will always consider their audience when selecting the tracks to be played but the actual setlist needs to be directed by the bride and groom as they are the hiring company. There are all sorts of DJS from the Club DJ who is used to playing his standard fare to the mobile DJ who travels with portable sound systems and plays recorded music at a range of events. Some DJs also ‘toast’ or ‘rap’ or serve as the master of ceremonies, directing the attention of the audience. Some DJS use turntables, others laptops, some a bit of both. One thing is for sure, a DJ’s personality, reliability and engineering acumen are as essential as the music he downloads. 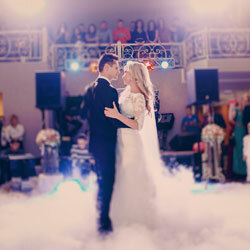 A wedding DJ literally creates the soundtrack to your wedding. There will be moments of sheer crazy ecstasy, times to celebrate and share deep family emotions, intimate sharing with your beloved, tears at farewells, fun and joy with friends - all of these require a specific soundtrack. The DJ edits your day as much as the photographer as sounds and music set the mood and vibe. They are what you (and your guests) will remember for a long time afterwards.